The long-term unemployed will be among the first to feel the effects of the forced budget cuts scheduled to take effect on Friday. The long-term unemployed in Indiana got a reprieve late Thursday after the state reversed a plan to temporarily halt federal jobless benefits. The state had said it would stop the checks this weekend because it needed additional guidance from the federal government concerning the forced budget cuts that will take effect Friday. It received those answers late Thursday afternoon. "The U.S. Department of Labor confirmed that unemployment benefits will not be impacted by sequestration through the week ending March 9, and additional guidance will be forthcoming," wrote Scott Sanders, commissioner of the Indiana Department of Workforce Development, on the agency's website. "As such, the Indiana Department of Workforce Development will proceed with full payment of extended unemployment compensation until further notice." The confusion in Indiana is playing out across the nation as states, cities, government contractors, non-profits and others await the $85 billion in budget cuts set to start Friday. Few have answers on how this will play out or whether Congress will act before the reductions fully take hold. The long-term unemployed -- who collect extended federal benefits -- will be among the first to be hit by the forced spending cuts. States are waiting for guidance from Washington, D.C., so they can reprogram their computers to accommodate the spending cuts. Some 3.8 million people could see their weekly benefits drop by 9.4% if the budget cuts go into effect, according to U.S. Department of Labor estimates. Recipients of those payments would lose an average of more than $400 in benefits each this fiscal year, which ends on Sept. 30. State benefits will not be affected. 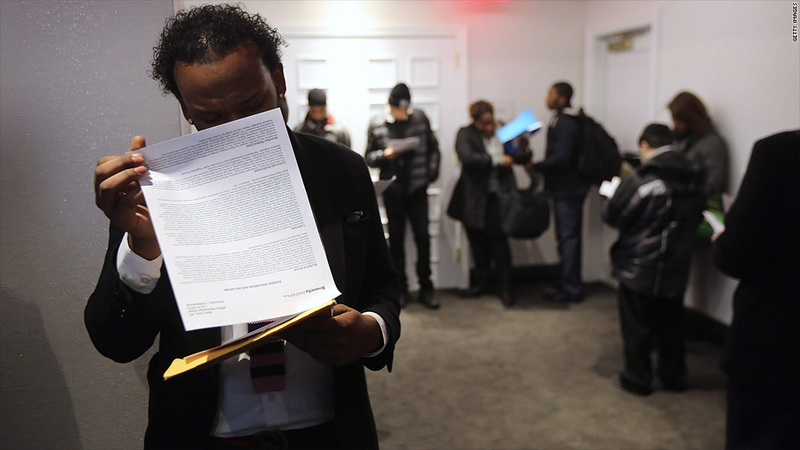 The jobless can collect state benefits for up to 26 weeks after they're laid off. After those run out, the federal program kicks in. Just when the long-term unemployed will see smaller checks depends on where they live. It could take a few weeks, as states scramble to adjust their systems. In states that implement the change immediately, the jobless would receive reduced payments during the week of March 11th, said Brian Langley, unemployment insurance director for the National Association of State Workforce Agencies. Any reductions, though, would be retroactive to March 1. Federal extended benefits payments kick in when state unemployment insurance ends. Eligible workers can then collect federal benefits for up to 47 weeks. The payments, which average $300 a week, are an emergency measure that Congress has been authorizing since 2008. It's a stopgap aimed at protecting the millions of Americans struggling to find new jobs in a challenging economy. The forced spending cuts don't end the program's funding, but they trim it.